Washington County is a small, rural county adjacent to the Albemarle Sound. Its largest town and county seat is Plymouth. It was established in 1799 and named after George Washington. The county’s top industry is agriculture. With only about 13,000 residents, Washington County is lightly populated and has a low population density as well. Job losses have fueled steady outmigration over the past few decades, with most of the loss in population coming from whites. Currently, Washington County is nearly a majority black. This demographic largely accounts for the county’s Democratic political affiliation, though the vast majority of whites are also Democrats, albeit conservative ones. Washington County has not gone Republican in a presidential election since 1972. The last Republican to carry it in any statewide contest was Jesse Helms in 1990, who had unusually high support from normally apathetic rural whites in his race against Harvey Gantt. Since then, losses in the white population and increased registration of black voters have moved Washington solidly into the Democratic column. In 2012, Barack Obama won Washington with almost 59% of the vote, improving on his 2008 margin. His opponent Mitt Romney carried only one precinct here. In Congress, the county is divided between the 1st and the 3rd congressional districts, represented by Democrat G.K. Butterfield and Republican Walter B. Jones. 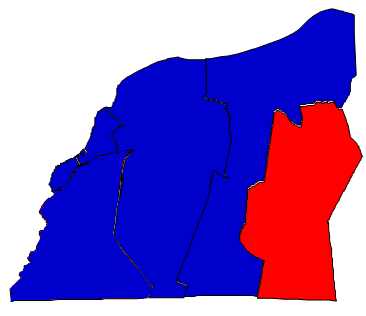 The 1st takes in the black areas of Washington, including the county seat of Plymouth, while the 3rd takes in white areas. Washington is also in the 3rd State Senate district, which is majority black and represented by Clark Jenkins. In the State House, Washington belongs to the 6th district, which is represented by Democrat Paul Tine. Forecast: Washington is an inelastic county, thanks to racial polarization. White voters in this region used to vote Democratic at all levels of government; now they vote Republican, especially at the presidential level and against Barack Obama in particular. About 80% of white voters in Washington County supported Republican candidate Mitt Romney last year. In federal elections, this polarization makes it difficult for Democrats to break the 60% barrier. In statewide elections, white voters are more Democratic and this number is easily reached. High black turnout helped Barack Obama improve on his margin here in 2012. This high black turnout is unlikely to be replicated in the future, but consistent outmigration of white voters hardly renders this a concern for Democrats. Washington was one of the few counties in North Carolina to lose population between the 2000 and 2010 U.S. censuses, with a -3.61% rate of growth. If current trends continue, Washington will decline in population by 17% this decade, the sharpest decline of any county in the state.